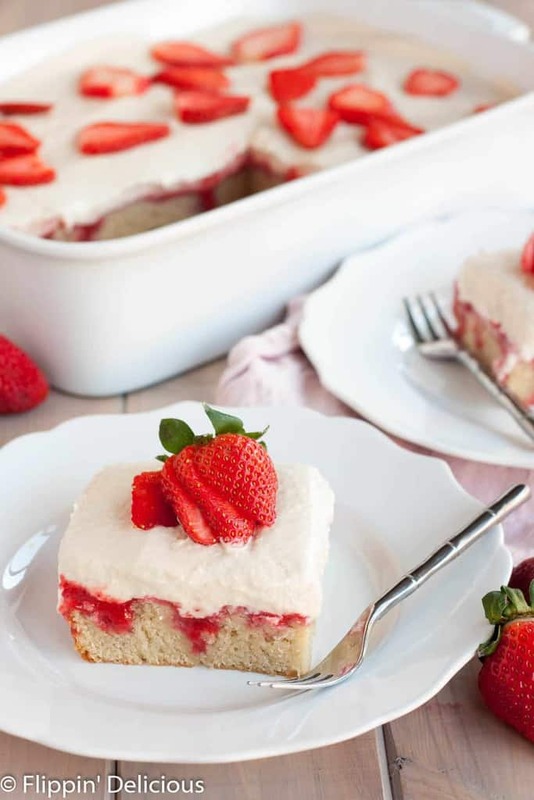 Dairy Free Gluten Free Strawberries and Cream Poke Cake makes an easy crowd-pleasing dessert. I love the simplicity and indulgence of poke cakes. There is no trimming or layering, or even removing the cake from the pan. Poke cakes are so easy, yet decadent. They are moist and full of flavor. When I need a crowd-pleasing cake that is easy to transport I always reach for my gluten free coconut poke cake, Harry Potter-inspired gluten free butterbeer poke cake, or gluten free cannoli poke cake. It was about time I added a dairy-free poke cake to my recipe collection! 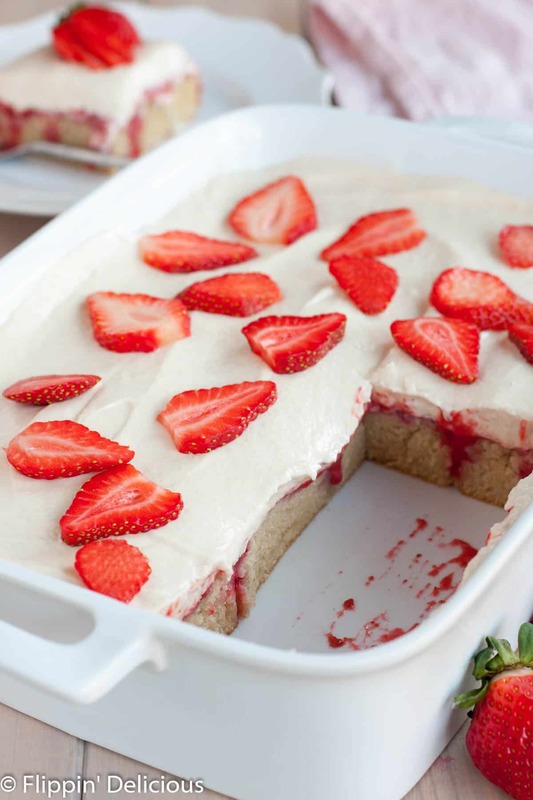 A gluten free strawberries and cream poke cake sounded like a classic to me, so I whipped up this gluten free and dairy free strawberry poke cake for you. When making a poke cake I often reach for a cake mix or use my homemade gluten free white cake mix. It is so easy and makes the recipe a cinch to bake. If you want to serve a gluten-free and vegan cake just use a GF and vegan cake mix or use an egg replacer with a GF cake mix. Another great base cake recipe is Gluten-Free on a Shoestring’s Gluten-Free Vanilla Cake. I still consider Nicole the queen of gluten-free baking. How do you make a gluten free poke cake? To make a gluten free poke cake, while the gluten free cake is still warm, you poke holes in it with a fork or the handle of a wooden spoon and then pour a filling (often times, sweetened condensed milk) over it, allowing it to soak in. A fluffy whipped topping and some sort of garnish (like sliced fruit, chopped candy, or sprinkles) is all you need to complete the easy yet indulgent dessert. 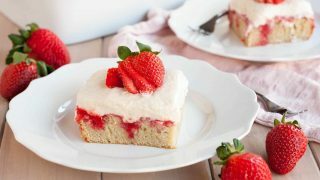 I used a simple homemade strawberry sauce to soak the warm cake and then topped it with a fluffy pudding. This recipe was the perfect opportunity to showcase Vivian’s Live Again Vegan Instant Vanilla Pudding and Vegan Whipped Topping Mix. 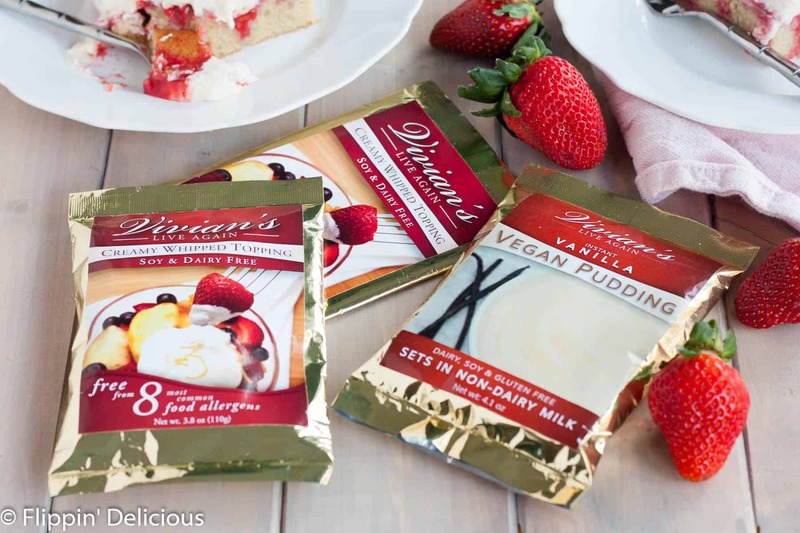 Vivian’s Live Again’s pudding sets in dairy-free milk! All I did was whip up the whipped topping according to the package directions, whisk the Vegan Instant Vanilla Pudding with some almond milk, and fold the two together. 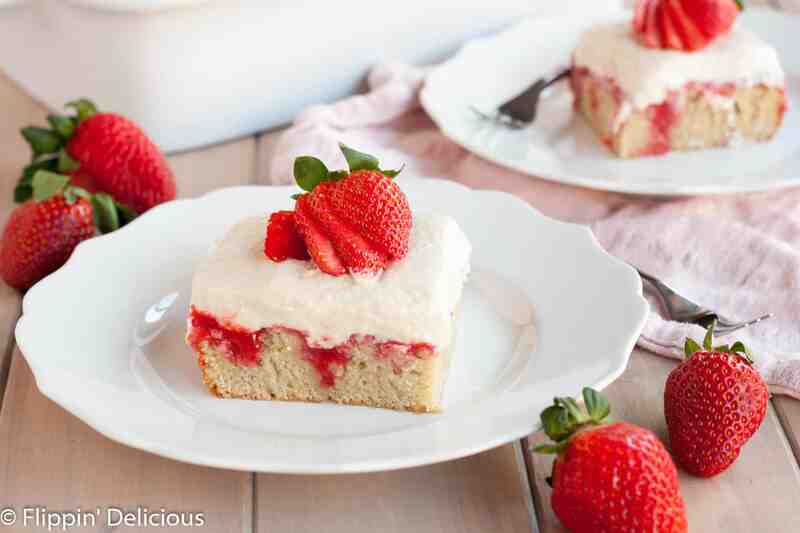 Each slice of gluten free, dairy free strawberry and cream poke cake was perfection. Lightly sweet, fresh, creamy, and berry-licious. If you are a fan of strawberry-licious desserts, I think you’ll also like my friend Vegetarian Mama’s Strawberry Rhubarb Crisp. Not only is it gluten-free, it is vegan too. Poke holes approx 1/2 inch apart in the baked cake. Puree the strawberries and 1/4 cup sugar. Pour into a microwave safe bowl and heat for 60-90 seconds or until it starts to bubble. Add the remaining sugar to taste, if desired. Pour the sauce over the cake and spread it so that it soaks down into the holes. Whip the whipped topping mix according to the package directions. Whisk the instant pudding mix with 1 1/2 cups dairy-free milk. Fold the whipped cream carefully into the pudding and spread it over the cake. 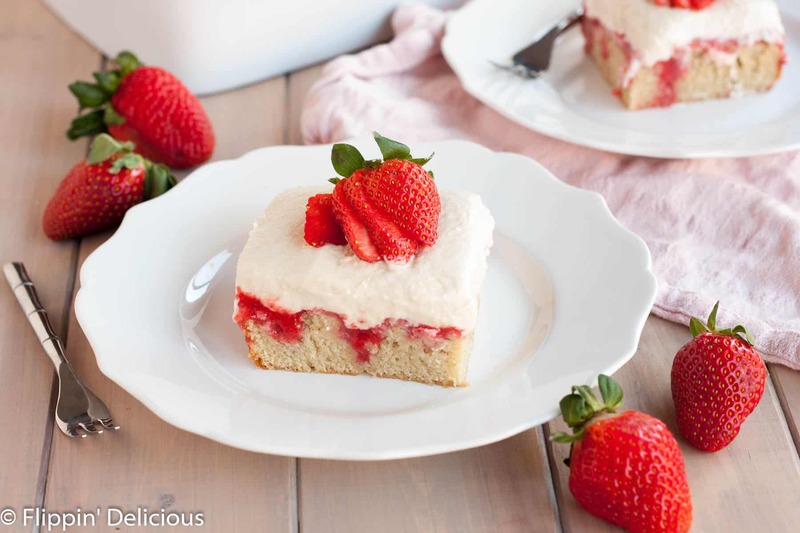 Slice fresh strawberries to garnish the cake. I love strawberry cake very much and this recipe is so perfect to me. I will make it on this weekend and invite some friends to taste it. Hope that they will like it and recommend the site to the others. Thank you so much! I made this dish last sunday and my family really liked it, especially my little daughter, she was crazy about that cute strawberry cake. Many friends asked me how to cook such a tasty dessert. Thank you very much!!!!!!! The cake looks gorgeous and delicious. We are having a birthday party next week so I will consider making it for our dessert. Everybody will love it. We enjoy dishes that feature strawberry. Thank you for your great recipe. Thank you, Kristi! I hope that you and your family enjoy it. I would like to make this for my daughters bday. Can it be made the night before and then be refrigerated until eating? Or would the cake become too wet? Let me know thanks! Hi Lindsay, you can definitely make it the night before and store it in the refrigerator. It is best when it has a few hours to sit.